Lately, Chicago has been pretty chilly and with the overcast and rain we've had today, it was a perfect time for soup. This soup came together purely as a hodge podge of random things I had leftover to use up. From the homemade chicken stock I made over the weekend, to the last bit of cream in a carton, and the small crumpled bag of frozen peas hiding in my freezer, they all got thrown in to create a soup that hit the spot. There's also a hint of lemon juice to brighten the soup up... a special favorite of my husband's when it comes to chicken soup. 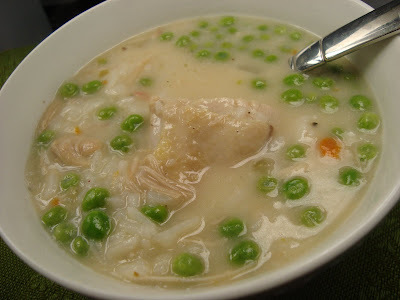 This was a hearty soup with some large pieces of chicken to make it a meal all in itself... and although the soup was based on whatever I had on hand, my husband has now requested I make this more often! In a dutch oven, add the oil and warm up over medium high heat. When the oil is hot, add the garlic, onion, celery, and carrot. Cook until softened. Add the chicken and brown slightly and then add rice. Stir to toast the rice for a minute or two. Add the chicken stock and lemon juice to the pot. Bring to a boil and stir. Lower the heat and allow it to simmer until the rice cooks completely. When the rice is cooked, allow it to continue cooking until the rice naturally thickens up the soup. 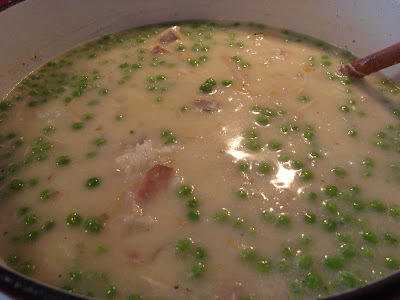 Add the cream, and frozen peas. Continue cooking until the peas have warmed up and serve. What a comforting soup, it sounds delicious and I love the lemon juice you added!